Pour boiling water over the shiitake mushrooms in a bowl and let them soften for at least 10 minutes. Meanwhile, in a large pot of boiling water, cook the noodles for 3 to 4 minutes, or until al dente. (Do not overcook the noodles, because they are going to be cooked again.) Drain the noodles well and spread them out on a kitchen towel to dry slightly. To make the sauce, in a small mixing bowl, combine the ingredients and whisk to blend, making sure that the cornstarch is dissolved. Drain the shiitake mushrooms, reserving the soaking liquid. Strain the soaking liquid through cheesecloth and add 1/2 cup to the sauce. Trim the stems of the shiitakes and set aside. In a wok or large, nonstick skillet over high heat, heat 2 tablespoons of the peanut oil. Add the noodles and toss using 2 large forks or spoons until crisp and golden brown, 3 to 5 minutes. Transfer the noodles to a bowl. Heat the remaining 2 tablespoons peanut oil in the wok or skillet over medium-high heat. Add the scallions, ginger and garlic, and quickly stir-fry for 1 to 2 minutes. Add the carrots, peas and fresh mushrooms, and continue to stir-fry, stirring and tossing constantly, until the vegetables are crisp-tender, about 2 to 3 minutes longer. Add the shiitakes and the sauce to the vegetables. Raise the heat to high. Add the meat and stir until the meat is heated throughout and the sauce is slightly thickened, about 3 minutes. Taste for seasoning. 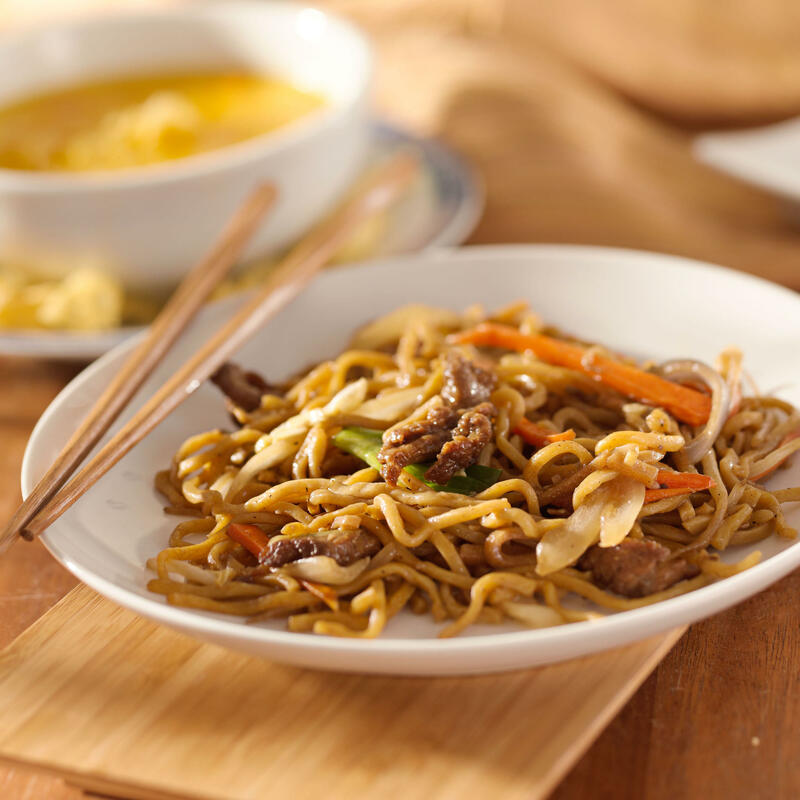 Just before serving, stir the noodles into the stir-fry just to heat them through. Transfer the mixture to a serving bowl and serve immediately.